So another season of Sleepy Hollow is nearly over. For fans of the show, it means that once again Fox will keep you waiting to know the fate of your obsession. But it also means something special to those of us who love those of you who love the Hollow, or in my case, Mrs. TV Recaps. Yay! Anyway, here are some of my thoughts about the show in general and how it has affected our loved ones and households. We can’t always tell twistory from history. Benjamin Franklin really took air baths? Dear #Sleepyheads, we’re Team #Ichabbie too. We want the writers to know that we’re about as tired of the teasing as you are. While we try to follow the plot, we are not always sure just what the heck is going on. We understood Headless, he made sense and he was a badass. But after that, it becomes a jumble of portals, monsters and mayhem. We’re deeply concerned. Honestly, if Fox doesn’t renew this thing, we think you’ll take up weird hobbies like taxidermy, making dog hats or creating emojis from dryer lint, and this is just plain no good for anyone. 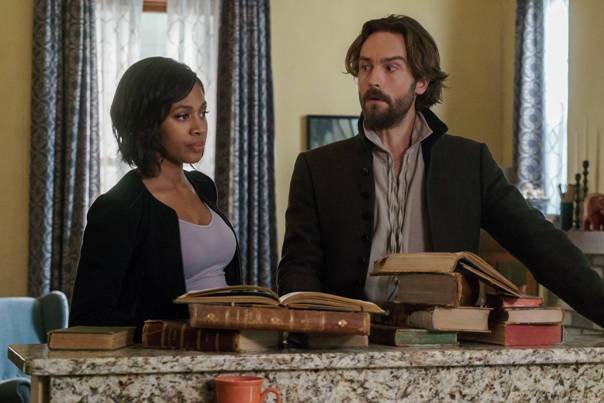 So, I say, come on Fox, get it together and renew Sleepy Hollow. Now!